I’ve been so busy doing Girl Scout stuff that I’ve had no time lately to write about Girl Scout stuff! But I did want to share this idea because it was a huge, huge hit at our last meeting and I think it’s so versatile and the girls loved it! 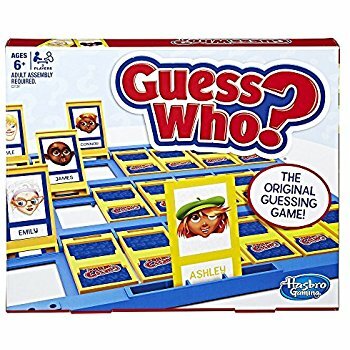 Last meeting we were working on our Detective badge (for our Juniors, Special Agent for our Cadette, and Senses for our Brownies) and one of the things we did was play a living Guess Who game. Have you ever played Guess Who? My girl used to love this game! Guess Who? Fun for Girl Scouts! I came up with the idea based on ideas I saw on a lot of other pages talking about ways to earn the Detective badge. Honestly I threw it together at the last minute and thought we’d give it a shot and see how it went. But the girls loved it! Essentially I printed out pictures of all kinds of characters; everyone from Minnie Mouse to Olaf to Buzz Lightyear to a puppy (you always need some unexpected wildcards!). I cut out the characters and to play the game, taped one to the back of each girls shirt. So the other girls could see who she was, but she had to ask them yes or no questions to figure out who she was. Sounds so simple, but sometimes the biggest hits are! They wound up playing again and again and I wound up having to scribble some new names on a piece of paper just to keep it interesting. I added “Juliette Gordon Low,” of course, plus Wonder Woman and lots of others. Tonight I’m planning to do a game of Cookie Guess Who to get the girls psyched for cookie season coming up soon; I will have them each be a cookie. But there will be wild cards; like Oreos, Chocolate Chip Cookies, maybe an ice cream cone or a hot fudge sundae! I like to keep them guessing. You can make this as easy or as hard as you like for your girls depending on their age and interest. This is going to be one I try to keep in the back of my mind if we are ever at a loss for something to do (which honestly rarely happens) or waiting in line or something! Click here for the pdf of Guess Who Characters with 12 characters, and click here for the pdf of Cookie Guess Who guest starring Oreos, chocolate chip cookies, and animal crackers! Have fun and remember, the girls are always here to learn and grow and HAVE FUN! More spiders, because who doesn’t love spiders?